Throughout the past year there have been strange sightings of stars in the Mourne Mountains, and I’m not talking about the recent filming for the HBO Game of Thrones series. 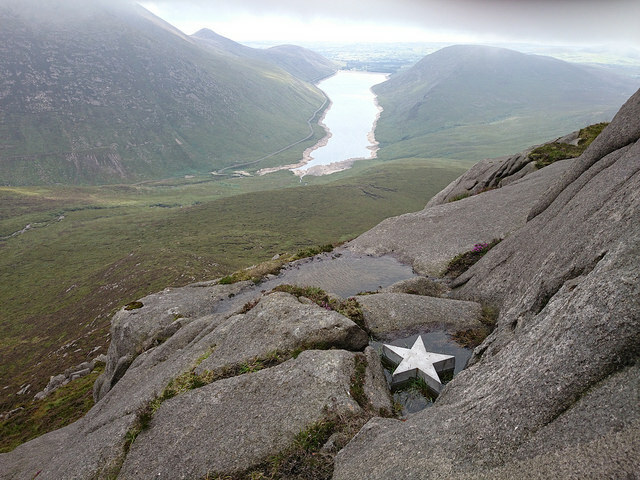 The stars that have been spotted are large in size, made out of concrete and have been found in a number of places in and around the High Mournes, including Slieve Meelmore, Eagle Mountain and most recently on Doan, overlooking Silent Valley Reservoir. Just like some individual has made the effort to bring these objects to the mountain, some individuals have also taken it upon themselves to remove the stars, as some are no longer there. 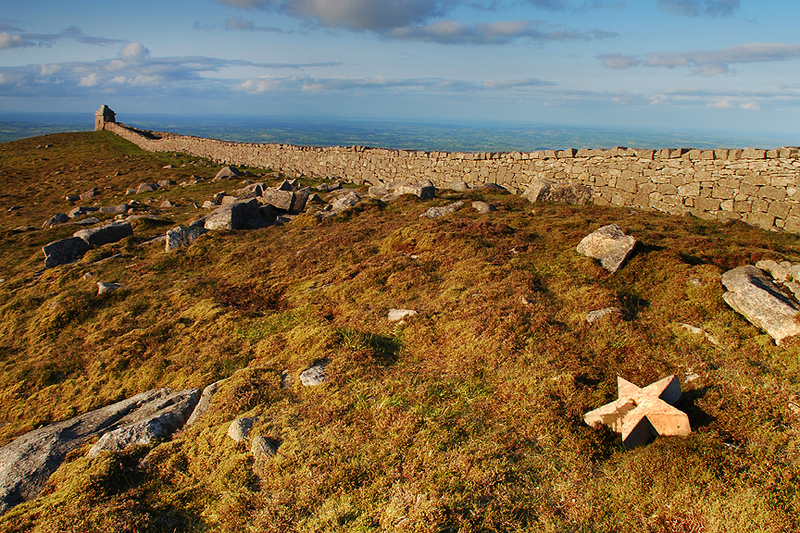 The concrete star spotted on Slieve Meelmore has since been broken up into small pieces and built into the already standing summit cairn, while the star on Eagle Mountains is still there as far as we are aware, with the star on Doan being the same. The question on my mind isn’t how they got there (although that’s a good one too), or if they should be removed (another point that can be debated), the question I would like to have answered is what do the stars represent? Do the stars hold meaning in some form of art or a treasure hunt or are the more sincere in meaning, representing something as a memorial for a lost loved one. If the meaning is that of the later, the situation and morals behind deciding on whether or not to move these concrete objects becomes more complicated altogether. Star on Eagle Mountain. Pictured by our own writer Spud, November 2013. Mountains hold a special place in a lot of peoples hearts, and it’s not a surprise that it is where some relatives chose to remember their loved ones when they are gone. On the other hand the placing of memorial plaques has become a controversial issue, as many feel that the mountains should be left untouched by the hand of man. The issue of memorial plaques is not only local, the Ben Nevis Trust has gone as far to ban memorial plaques on the mountain in order to preserve its wild character of the mountain for the people of years to come. Does that set a standard that should be followed all over the UK or is it only necessary when there are such high numbers of visitors? 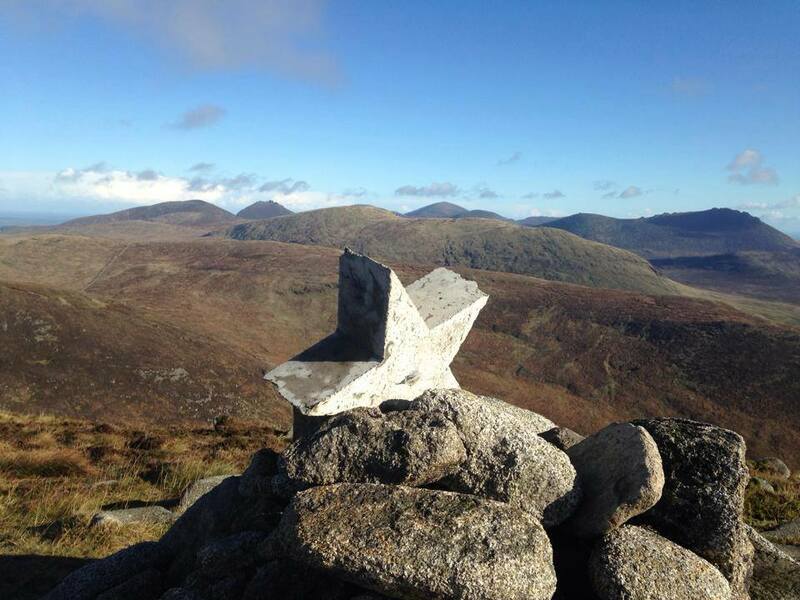 The spotting of concrete stars in the Mourne Mountains only raises more questions than answers, such as what should we do if we find a man made object like this in the mountains? Do we leave these objects as we found them or are we as hillwalkers responsible to keep the hills in the condition that we want them to be – free of litter and any sign of man. The mark of man can be hard to categorize as summit cairns are many and often and some see them as an eyesore while others appreciate their navigational aids. Litter in general is something that most agree on, it has no place in general especially in the mountains and no one wants to see it there, but what happen with larger objects? Some view these monuments as foreign while others may see them as a connection to a loved one, so who decides where to draw the line and what to do about it? A somewhat grey area with advisory boards and conservation groups only having limited power to advise the owners of the land, which in the case of the Mourne Mountains is largely the Water Board and private land owners. If you have any information or pictures on this strange happening, please leave a comment or drop us an email. Do also let us know your opinion on such matters. 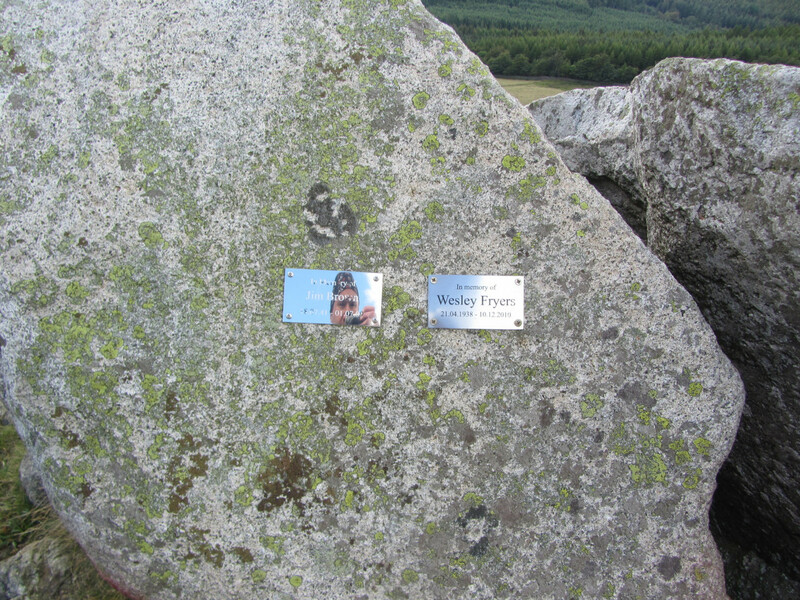 Do concrete stars and memorial plaques have no place in the mountains? Or do you feel that people should be able to place their memorials where they choose? Let us know in the comments below, we would love to hear the opinion of the outdoor community. It's mysterious how little information there is on-line about the concrete stars. I was wondering do they make any cohesive shape on a map when looked at from above, do they line up in anyway or are they just random. Have they been placed to align with certain stars above like modern versions of some neo-lithic cairns, it's a head scratcher alright.